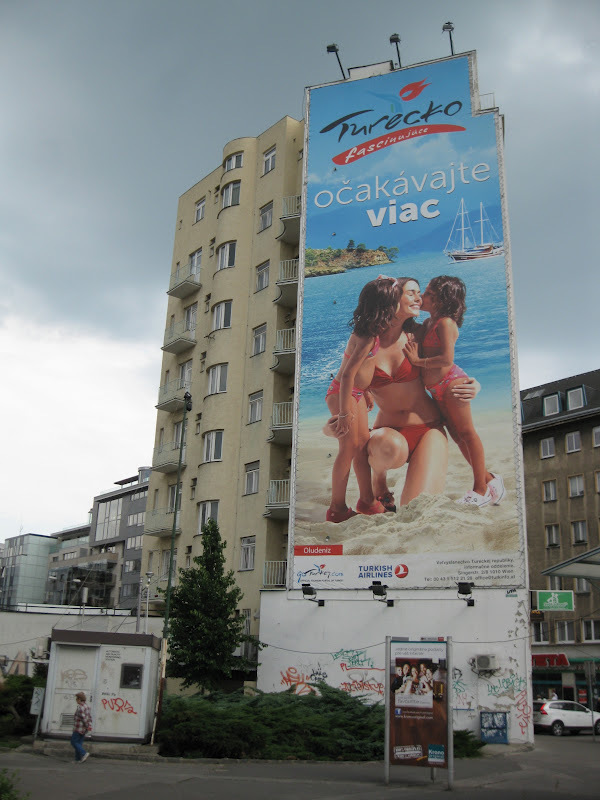 So this isn't exactly breaking news, but back in May this year Bratislava's monuments board announced that it was denying the request to turn the commie-era Hotel Kyjev/My Bratislava/Tesco complex into a protected cultural monument. This comes at a time when the developer that has purchased the entire block is devising plans to radically renew the whole premises, potentially putting the buildings in jeopardy. Initially, the board offered vague reasons about how certain criteria had not been met, citing the building's relatively poor condition. But several weeks later, Metropola, a free local monthly magazine, ran a piece in June that discusses the monuments board's objections in a little more detail. The board objects to the fact that the communists razed an entire city block to make room for the buildings and the adjacent public space (called Kamenné námestie), and made zero attempt to blend them with the surrounding urban fabric. They also argue that just because an architectural concept was "interesting" back in the 1970s, that doesn't make it "interesting" today, and is not enough to warrant protected status. 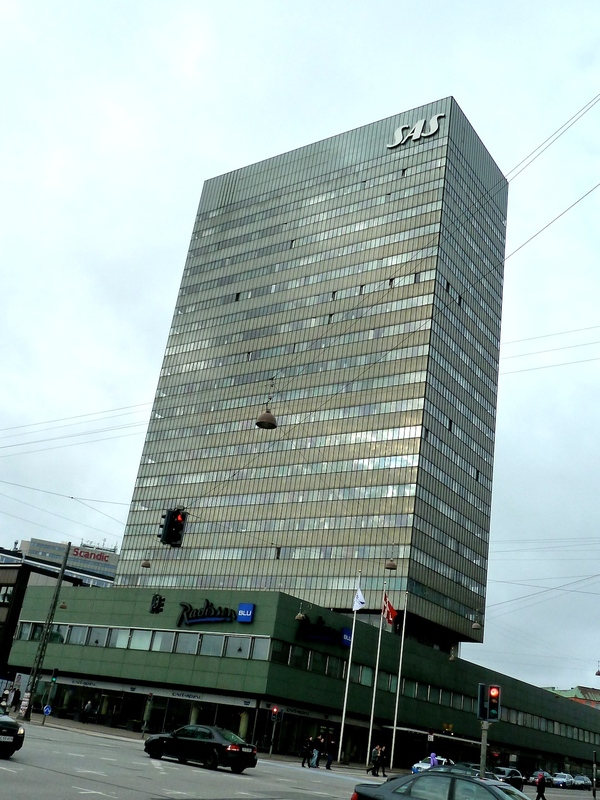 They also point to visual similarities between Hotel Kyjev and the Radisson SAS in Copenhagen and the Lever House in New York, implying that the hotel's design, by Ivan Matúšik, is not so unique anyway, so why the hell can't people just shut the hell up and let the developer get on with its plans for the space? Granted, I can kind of see what they're getting with their first point. I mean sure, it is horrifying to contemplate all the unique and attractive historical buildings from centuries past that the communist regime bulldozed to make room for this complex. And some of the damage they hamfistedly inflicted on other parts of the city is deeply depressing and should stand as a prime example to all of how not to redevelop an urban setting. And yes, the communists arrogantly plopped the Kyjev/Prior complex right down in the center of town without any regard for its surroundings. But they did that with just about every building or monument they built in the city, pounding their rigid, blocky aesthetic into any hole they could open up. The damage done by Kyjev is peanuts compared to what happened to the old Jewish borough and the Podhradie area when they built the SNP Bridge. Kamenné námestie long before the communists got their hands on it. Kamenné námestie today: only the Bata building (center) remains. This is troubling because it means the monuments board could use this excuse to deny protected status to any one of the city's numerous and unique mid-20th century modernist commie-built buildings. Was it worth tearing down large sections of the old town to make this stuff? In most cases, probably not. But the fact of the matter is that these commie-era buildings are here now, and some of them are genuinely unique and striking examples of mid-20th century modern architecture and design, and to leave them vulnerable is to potentially undermine an entire era of the city's rich history. The board's second point is one of the stupidest things I've heard. So, does this mean that we're going to just cherry pick the historical eras and designs that we like and give the finger to those that we're not that into? Just because a renaissance palace was "interesting" in the 1600s doesn't necessarily mean that it's "interesting" today, but because many of us agree that this history is an invaluable part of the city's landscape and is therefore worth preserving, we keep these old buildings around. So, why should a unique and era-defining building from the early 1970s be treated any differently? Do we really have to wait a century or more for a building to suddenly become "interesting"? To favor some eras of history and disregard or whitewash others is a colossal mistake, especially when that particular historical chapter had an undeniably massive impact on society that still lives on today. And with so many other era-defining buildings from throughout history having been tragically knocked down because they were deemed uninteresting or in the way, why do we have to keep making the same mistake? And to the monuments board's third point - yeah, Hotel Kyjev does appear to have been inspired by those other hotels, but upon closer inspection, you can find numerous differences in the details, which makes the building more unique than it might appear from a distance. Plus, the way that the hotel and the lengthy rectangular slab it sits on (most of which is inhabited by Tesco) work compositionally with the adjacent triangular building sets the whole thing further apart. Besides, think of how many gothic cathedrals or baroque palaces look nearly identical to each other. You could never get away with denying protected status to one of Slovakia's wooden carpathian churches simply because it looks like all the others. Granted, Hotel Kyjev may not have the same broad appeal as one of those, but still, I think that this particular argument of the monuments board is pretty weak tea. We've already got a bunch of old Carpathian wooden churches that look like this, so what's the harm in mowing this one down so that we can put in that new shopping center? What - all these churches have protected UNESCO status? Damn! It's the details of Kyjev/My Bratislava that really help set it apart. The general attitude of the monuments board seems narrow minded and myopic to me, and is indicative of the kind of mindset prevalent during the communist regime. The communists in Bratislava razed entire blocks of priceless historical buildings, arguing that because these structures were the product of a diametrically opposed ideological system, and because they were impractical and stood in the way of their vision of a modernized city, they were therefore deemed to have scant historical value or architectural merit. Of course the monuments board is not sanctioning full-on demolition of priceless commie-era mid-20th century buildings, but it's currently not doing much to protect them either, and it doesn't appear to be concerned that some of these buildings are in serious need of repair and maintenance. Instead, they seem to use the buildings' shoddy condition as an excuse for not granting them protected status, as is apparently the case with Hotel Kyjev. The communists' neglect of a lot of pre-war historical buildings resulted in many of them rotting and disintegrating, sometimes irreparably. It's pretty ironic how in "punishing" the communist regime and its buildings, the monuments board is essentially adopting the same general mindset that it claims to object to. I would just hate for the city to let this truly unique historical layer go to waste. I think we can all agree that the communists' approach to urban renewal was generally highly destructive and totally insensitive, but that doesn't mean we have to toss out the things they created that really do have merit. If anything, these structures should be left to stand in part to illustrate both the political and aesthetic rigidity of the regime, so that people can see how its uncompromising starkness contrasts with previous architectural styles. It's a fascinating layer of history that makes the city, with its numerous other layers, all the richer. At the same time, it's crucial to make the city as livable as possible for its half-a-million inhabitants - a concept that the communists were clearly not always in tune with. And that's why I'm all for any efforts to improve Kamenné námestie, the public space in front of and around Kyjev/My Bratislava, to make it an inviting and functional place. The monuments board has talked about how crappy Kamenné námestie is, and I agree with them on that point. As a public space, the square is an unmitigated failure on every level: it's totally uninviting and slightly scary; it's cluttered with ugly, randomly placed makeshift cafes and snack stands as well as unsightly juniper hedges and other threadbare shrubbery that you can often see men peeing in; the surface of the pavement is a jumbled and warped patchwork of asphalt riddled with cracks, pockmarks, and potholes (some of which fill up with ice in the winter, turning sections into a slippery obstacle course); the square's western tip has been given over to a small parking lot and some disused underground toilets; much of the square is hemmed in by these ugly grey concrete planters that are empty for more than half the year; hideous colossal billboards overlook several sections of the square; there are a few loud, gaudy casinos at one end of the square; and the whole thing feels like something you merely pass through to get to somewhere else, rather than a destination in and of itself, like a well-conceived public space should be. Does this look like an inviting public space to you? Tacky, massive billboards add to the noisy clutter. There is also a long, narrow parking lot that runs along the north side of the complex, which is another unsightly weed-strewn and potholed mess, and usually only half full, to boot. That is some primo space that's not being utilized wisely at all. Kamenné námestie is screaming out for a complete overhaul. There is oodles of potential and loads of space to work with. I'd concentrate on that rather than fuss with the Kyjev/My Bratislava buildings. What lies in store for Hotel Kyjev? Even though the monuments board insists it doesn't want Hotel Kyjev to be knocked down, and the developer, Lordship, says it plans to keep the structure intact and work around it, the fact that it's not protected could still open the door to substantial changes. The hotel's interior has reportedly been emptied and is slated for "modernization", which in itself is upsetting since the late 60s/early 70s design was quite unique and striking. But who is to say drastic changes won't be made to the exterior as well? Just because it's not being knocked down doesn't mean its appearance can't be altered. As long as it's not protected, anything's possible. And I'm leery of Lordship's apparent intention to essentially clog the space up with flashy new buildings full of retail, office, and hotel space, as you can see in a few visualizations below. There is already ample room for this stuff in the buildings that are there, and I'm sure the interiors could be reconfigured in a way that utilizes the space more efficiently. But we've also got a huge three-level mall called Eurovea that's a mere four blocks away, which is part of a sprawling complex that also includes a hotel, upscale apartments, and a bunch of trendy, overpriced restaurants overlooking the river. Just two blocks in the opposite direction from Kyjev we've got Obchodna Street, the old and recently revitalized shopping district which already has many of the same retail outlets that can be found in Eurovea, in addition to other malls that are further out, like Au Park, Central, Polus, and Avion. Honestly, It seems like the default, knee-jerk approach of developers when revitalizing any area in this city these days is to put in another shopping mall. There are only so many malls that a city with less than half a million people can handle, and I don't think clogging up the downtown with even more retail shops and hotels is what the city really needs. At the time of writing, this is what the developer has on its website. This plan appears to retain the Hotel Kyjev high rise, but does away with all the other buildings with a pretty radical overhaul of the space. Here is a visualization that the developer released last year. It doesn't reveal a whole lot, and it actually raises more questions than it answers, but it will nevertheless be interesting to see how they approach this. What's especially amusing here is the artist's lax attitude towards reality and the actual spatial relationship of the buildings. I tried to take a photo to match the visualization with real life, but I couldn't! The view in this visualization would be physically impossible to achieve without picking up all of the surrounding buildings and moving them back, like toy blocks. What you see in real life when standing in about that same spot. More real life, but shot from an angle where you can actually see the area that Lordship is working with. Notice how the artist has chosen to keep and integrate the beige, curved building in the center of this photo. At any rate, this proposal keeps that beige, pleasantly curved, early commie-era apartment building on the corner and attaches some new glass-n-steel structures to either side of it, forming a wall of buildings around Hotel Kyjev so that you can't see it from the western end of the square. But this wouldn't leave a lot of room between the buildings and the street for a public space, and would result in a good chunk of Kamenné námestie being buried beneath the new buildings or hidden behind them. Here is another visualization, which appears to nix that beige corner building, and fills up a lot of Kamenné námestie with glass-n-steel structures, which again doesn't leave room for a very substantial public space in front of the complex. However, it appears that the artist is trying to unify the surrounding space and adjacent streets with some nice landscaping in an attempt to make the whole area larger. Of course, the problem with both of these visualizations is that neither give any clue as to what they plan to do with the Hotel Kyjev/My Bratislava buildings themselves. When Lordship first bought the site, they initially wanted to knock the whole thing down and replace it with a kind of massive biodome looking structure. A few variations on this theme were presented to the public back in 2006. But then when some people, including modern architecture conservationists DOCOMOMO, spoke out against the plans to raze everything, the developer began talking about incorporating the hotel into their plans instead. I fused together an aerial satellite image of Kamenné námestie and Hotel Kyjev/My Bratislava with one of the developer's previous design proposals, which actually isn't a million miles away from what they've got on their website at the time of writing. Now, at first glance it appears that Hotel Kyjev is still there, albeit after an exterior make-over, but on closer inspection, notice how that Kyjev-looking high rise is actually shifted to the left so that it is much closer to the street. Is this another case of the artist playing fast and loose with physical space? I suppose something like this could still work with Kyjev where it actually is in real life, but I was told by the developer when I asked them about it that this design was no longer a contender. And yet, as mentioned above, it's not so different from the plan they've currently got on their site. We'll just have to wait and see what happens. I'm a firm believer in getting the most efficient use possible out of the buildings that are already there, especially when the buildings are such unique examples of an important (if generally dark) era in history. All they really need to do is redo that public space, clear the clutter, and transform it into an open, attractive, and inviting spot that will compel people to meet and hang out. Alas, building retail/hotel/leisure facility space that can be rented out or purchased is where the real money is. Keeping these grand commie-era architectural gestures will only make the city a richer and more interesting place than over saturating it with ugly new shopping complexes. And for a city that's desperately trying to lure more tourists, and to get those tourists to stay here for longer periods of time, marketing this unique commie-era stuff would be a wise move: an increasing number of people are interested in both the history and the mid-20th century modernist aesthetic, and Bratislava has a lot more of this kind of thing than many of its central-European neighbors. I say flaunt it if you've got it. In an article I wrote for the 2012 Spectacular Slovakia on changes to Bratislava's urban fabric, I ended by saying that it would be a shame for Hotel Kyjev to exist only as an engraving on a plaque near to where it once stood (in reference to the engraving of the old synagogue located by the spot where it used to stand before it was demolished in the 60s). While it looks like we won't have to worry about that for now, it would still be sad if Hotel Kyjev/My Bratislava were to end up hidden behind or buried under yet another soulless glass-n-steel shopping center.